Roleadro GalaxyHydro 1000W LED Grow Light Review - Is It Worth It? Is the Roleadro GalaxyHydro 1000w LED grow light a good grow light? The answer is yes. I’m about to answer in detail why the Roleadro GalaxyHydro 1000w LED grow light is such a good grow light. You’ll find out about the Roleadro brand, the GalaxyHydro 1000w model, and how this grow light stacks up against other 1000w models. Buckle in. I think this is one of the best cheap LED grow lights around. First of all, we’ll start with its essential features and aspects that play a vital role in getting a better yield from your weed plants. Many factors are responsible for better marijuana grow yield outcomes like spectrum, power efficiency, coverage, heat dissipation and so on. Before I even get to the GalaxyHydro review, most consumers want to feel comfortable about the brand manufacturer first. How does Roleadro stack up? While I’ve been unable to find a Roleadro website to learn more about the brand from the horse’s mouth, I wouldn’t let that deter you yet. It appears Roleadro grow lights have been on the market for more than 10 years. During this long period they’ve efficiently improved their products as well. Perhaps the more imporant aspect is what owners of the Roleadro GalaxyHydro 1000w LED grow light think for themselves. A quick search of “Roleadro” yields a considerable list of grow lights and cannabis growing equipment. With this you know this is an established brand dedicated to their market. Most if not all of the products on the list have a high star rating. GalaxyHydro is one of their most known series of grow lights where they’ve provided several variants of different power efficiency. Their grow lights currently range from a low 75w to 2000w so regardless of your situation, Roleadro likely has you covered. As for the Roleadro GalaxyHydro 1000w grow light, it has very strong reviews (I don’t review bad products). Reviewers are saying it’s the best LED grow light when you consider price, warranty and customer service. Others are saying the fans work great without issues, and the light is built well. I’d say a large majority of existing customers are recommending it based on the results they’ve obtained. From brand and quality point of view there is nothing to doubt on it. What about Roleadro Galaxyhydro series 1000W LED durability? Well the manufacturer offers a generous 30 month warranty, so you’re guaranteed at least that long. The light also features a unique “bead and zener” design where if one of your LEDs burns out, it won’t affect the other LEDs. The build features a 90 degree optical lens which helps bring the final PAR value to 453umol at 18”. Up to 98% of light from the Roleadro GalaxyHydro 1000w is effectively utilized on your plants. 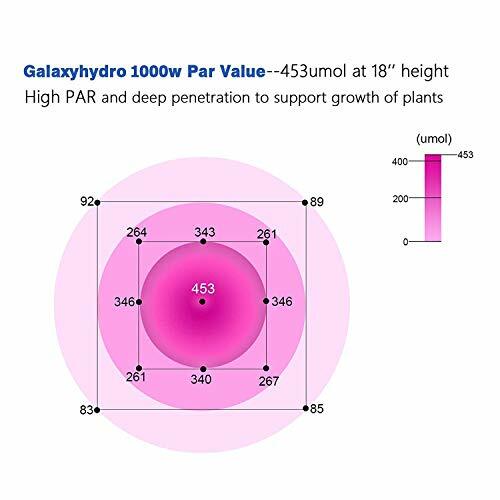 It seems like the safety of the user and grow light were both taken into consideration while designing this 1000W Grow Light for their Galaxyhydro series. There are two high speed cooling fans, aluminum heat sink and internal temperature controller. 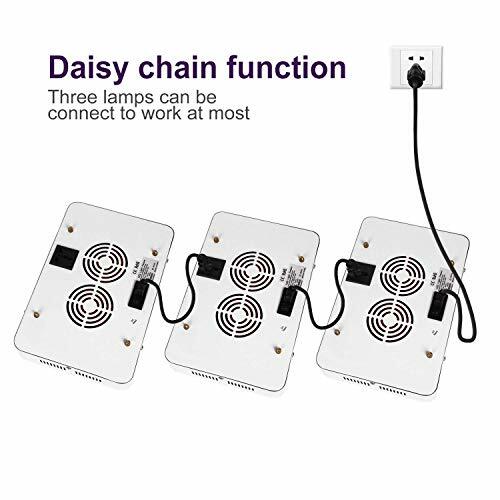 However, we noticed this grow light doesn’t feature dual-mode switches nor daisy chaining which is one factor to consider for your situation. In terms of price competitiveness, we searched for“1000w led grow light” and looking strictly at prices, the Roleadro GalaxyHydro 1000w is the most affordable choice, with competitors priced between 10-15% higher for the same wattage and coverage. This is one of the most vital aspects to consider before making any decision regarding grow light for indoor plants. Better spectrum means better growth and healthy plants. So, one should focus on a light that is capable of delivering all essential bands which are responsible for the quick boost in the process of photosynthesis. Majority of study states, that Red and Blue are the primary shades that play a massive role in improving plants health. However, we often recommend our readers to not rely on these two bands only. Now, if we get specific about the Galaxyhydro 1000W LED Grow Light spectrum, it spreads an optimal spectrum all over your canopy. Also, it is equipped with 100 10W LED Chips for producing this spectrum. It produces optimal light spectrum as they’ve included most vital bands of blue and red with the most effective ratio. Also, Inclusion of IR and UV along with warm white light makes sense for better effect and growth of your cannabis plants. If you didn’t know, UV is responsible for germination while IR is responsible for leaf building and cell formation. The GalaxyHydro 1000W grow light creates a pink shade of light in your grow space. The best thing about the pink shade is that it helps to grow bigger and more resinous buds at the time of harvesting. Nowadays, people often take HPS/MH replacement figures too seriously. Yeah, those are nothing more than a number. We recommend our readers focus on PAR and Power efficiency instead of concentrating on HPS replacement figures. For this Galaxyhydro 1000W LED Grow Light Review, Roleadro put the light through extensive testing, including for PAR value to help you determine the optimal height to hang your grow light. Their results found a PAR result on or about 453 uMol from the height of 18”. Which justifies the effectiveness of this grow light for any grow space. LED Suitable to 4′ X 4′ Grow Space. People especially beginners often get trapped by manufacturer’s claims of best coverage at low-cost. Yeah, it’s not the initial cost that makes any difference, but it’s the efficiency that makes a difference. A $50 grow light sucking 150W from the wall is worse than a 100$ grow light utilising mere 90W from the power outlet. Electricity cost is going to be your recurring expense and not the initial cost of your LED grow light. Now, if we consider the power efficiency of Galaxyhydro 1000W, then you’d be glad to know that it just consumes 132w±5% from the power outlet for its functioning. We’ve compared it with some of the close competitors of the Roleadro GalaxyHydro 1000w and what we observed has cleared all our doubts. It’s better than almost all significant competitors with 1000W variant. The next 3 competitors for the same wattage are consuming 165-185w, and are priced 10-15% higher. See for yourself. 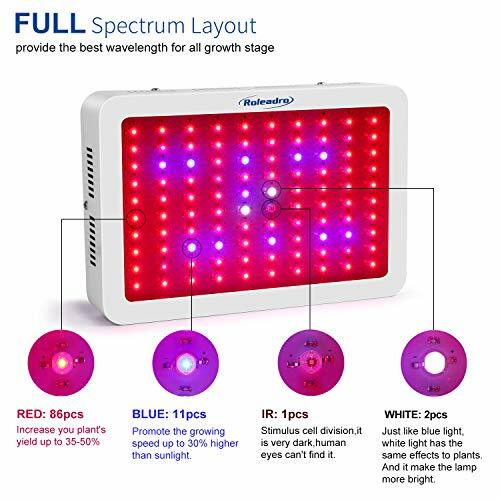 Moreover, it seems like the inclusion of 10W chips in this Roleadro Galaxyhydro 1000W grow light is a perfect decision by the manufacturer to create more effective light at a lower cost. This is truly one of the best cheap LED grow lights on the market. Now, comes the part that you might be concerned about the most. If we talk about Coverage capability of Roleadro Galaxyhydro 1000 watt, then it could cover around 3’X3’ of grow space from the height of 24” during vegetation. However, we recommend to keep lights closer during blooming and hence it’ll be reduced to around 2’X2’ of coverage from the height of 18”. Also, looking at the PAR results obtained by this grow light it is possible to get better output for a bit extended area by increasing hanging height. Although, we’d recommend you to stick to the recommended height only unless there is no other alternative is available for you. As we stated in the build section, this light doesn’t feature dual-mode switches so you’ll have to adjust its height manually when you think your plants are stepping into the blooming stage. Yeah, we too think that it is a considerable missing factor but looking at the price it is justified. Buying a hot running LED grow light because you can’t compromise on your budget won’t be the right decision at all. Keeping the perfect temperatures in your grow space is almostt as important for your yield as your light. For this Galaxyhydro 1000 Watt Review I read through the verified reviews and found owners who reported good working fans with no temperature issues several months after using the product. Don’t forget there’s a 30 month warranty so you shouldn’t have too much to worry about. The majority of people have stated that inclusion of multiple cooling fans and heat sink does its job effectively and keeps the temperature of light as well as grow space very well balanced. Noisy fans can be an annoyance but with this 10 year manufacturer we haven’t seen any complaints. We often suggest a beginner to start small. And, this one will suit you in case you’re planning to buy a grow light for your 36”X36”X60” grow tent with a tight budget. Roleadro is offers the GalaxyHydro at a highly affordable price level, and even some of the results obtained by this grow light are far better than some of the high-end premium grow lights. 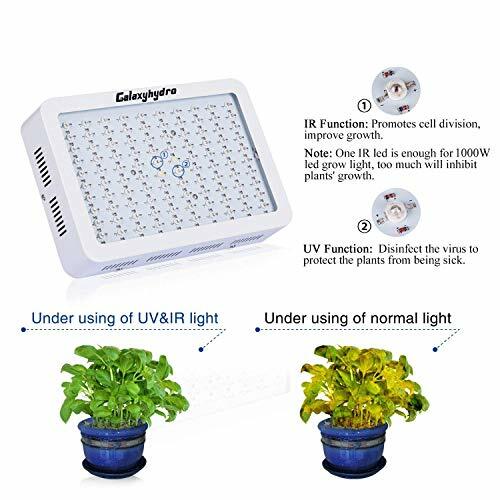 Also, it’s the right place to mention that while outreaching people regarding heat generation in this Galaxyhydro grow light, one of user stated regarding the issue of fans. In his case, he reached to Roleadro’s customer support, and his issue was resolved within an acceptable matter of time. Yeah, he got a replacement for his faulty product. So folks, that’s all the features of this cheap LED grow light. It’s one of the best bang for your buck out there. Now, let’s take some time and take a look at the pros and cons associated with this grow panel. I’m an indoor weed cultivator and love to grow it indoors. At the time when I started, I was running short on budget hence planned to bring this panel from roleadro for my plants. So far, I haven’t come across any issue, and it is doing well in my grow space. So far so good. I was a little bit sceptical about its performance because it is offered at a meager price on the market. However, I thought to give it a go after suffering Galaxyhydro 1000W Review on the internet. Since its entry in my grow tent, results are better compared to my old slim panel of 50W which was sucking around 30W. Also, I’ve taken full advantage of its extended coverage and had ordered a grow tent along with it. Someone on a forum recommended Roleadro Galaxyhydro 1000W to me, Bought it relying entirely on that guy’s recommendation and its customer reviews on Amazon as I was not capable of deciding how to measure the performance of a grow light as a newcomer in this hobby. However, after using it for more than 8 months I’ll have to admit that it is capable of delivering the real light to my plants. Looking at real-life experience and opinions of people we don’t think you need our advice. If we neglect daisy chaining and dual mode switches then galaxyhydro 1000 Watt has everything that is usually expected from an optimal grow light for a beginner. According to our research it’s one of the best budget LED grow light on the market as of now. We’ll recommend Roleadro Galaxyhydro to a beginner with a tight budget and who wants to start small. 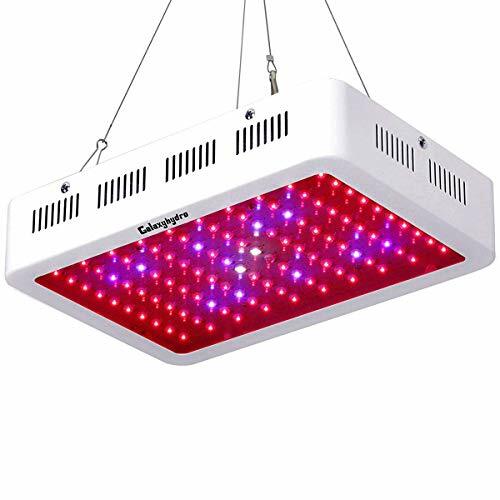 Yeah, in this Galaxyhydro 1000W Review our recommendation is based on the bright sides offered by this galaxyhydro series grow light which includes optimal spectrum, most efficient power consumption, highly effective light and coverage. However, for people with a bit open budget, we’d recommend going for Viparspectra Reflector Series 600W as it also offers excellent features at a competitive price.